Spring is in the air and we are so excited about being able to go to the parks and mountains again. This will be the first summer that Jensen will really be able to walk the trails with us, although I will probably still be putting him in the hiking backpack for most of our adventures. That is why I have been on the hunt to find the best washable shoes that will hold up against the rigors of toddler speed. One of his favorite things to do is to explore outside in the trees picking up sticks, rocks, and kicking a ball around. I have the fondest memories of losing myself in nature as a child. My brothers and I were almost always outside if weather permitted. Climbing trees, creating hideouts, and running free shaped many of our days and I never once remember my mom worrying about us ruining our clothes or shoes. Now that I am a mom myself I realize that this fancy free lifestyle was such a luxury and I worry about my boys destroying their clothes. Sometimes. I don’t worry too much about t-shirts as they typically aren’t too hard to clean, but I do worry about the shoes. OH, the shoes. My kids will soon develop the “yucky” pair and the nicer pair and I beg that they keep them straight when heading to our local treehouse. With Jensen wanting to keep up more than ever I want him to have shoes that I can trust will protect his little feet, but also will wash up well if we find ourselves in a “sticky” situation. Even though he isn’t quite two, he definitely has an opinion of which shoes are his favorite. 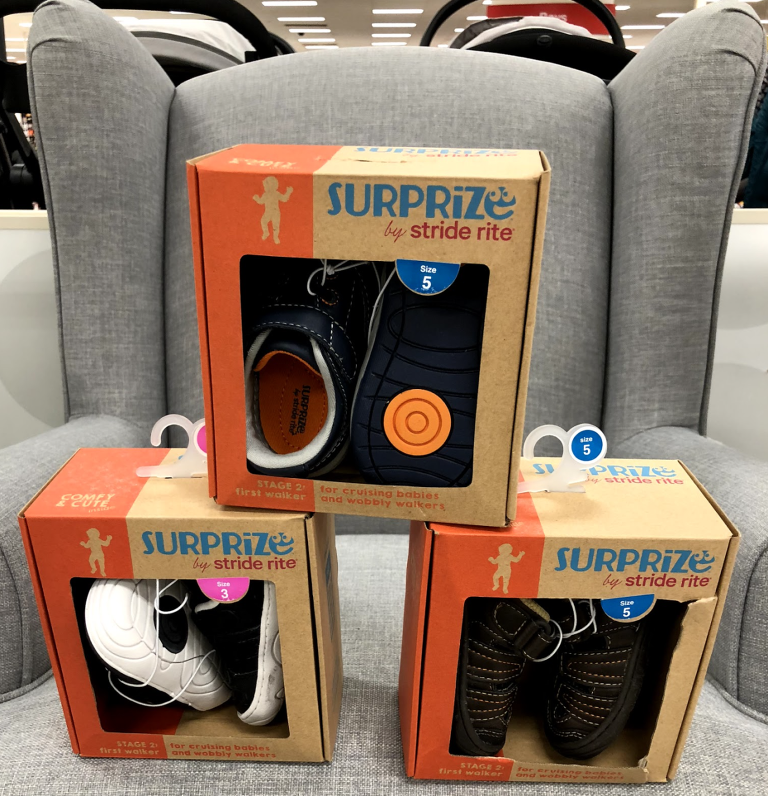 I was so pleased to find that Surprize by Stride Rite from Target has a line of shoes that are washable for babies/toddlers! There are many varieties to choose from, some are more athletic, some are made for land/water, while others are made to look a little more dressy. Make sure that you check the shoes as some of the styles are washable while others are not. Surprize by Stride Rite offers shoes made specifically for new walkers that are a little bit wobblier on their feet. With each pair of shoes Stride Rite promises to have a generous FIT, especially for medium and wide feet. Rounded toes and traction pods to reduce falls and tumbles. 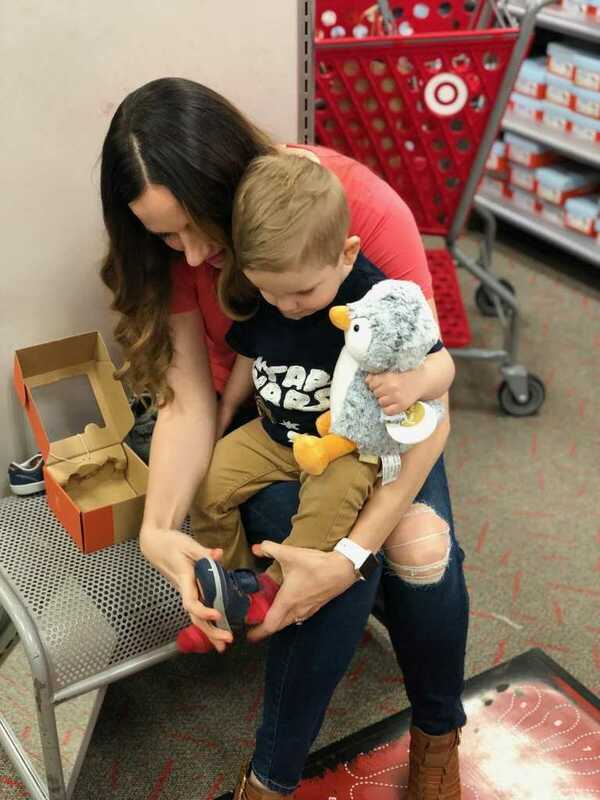 With a memory foam footbed you can rest assured their little feet are supported well.​​ All of the Stride Rite shoes for infant/toddlers have an incredible fit, for medium and wide widths. They have easy closures, are very durable, and have a memory foam footbed that comes with anti-sink lining.It is also important that their feet have the ability to move, so the fact that these shoes come with a flexible outsole helps aid shape and the natural movement and development of the foot. I also love that Stride Rite has velcro. Praise the heavens for shoes that open wide to accommodate chubby feet and also have velcro! It is so easy to put these cute little shoes on and off. One of the things I like most about the Stride Rite brand is that you can buy shoes that are specifically made to wash up well. If you have a busy child like me and you don’t want to have to worry about shoes getting ruined, these are the shoes for you! We are especially excited about visiting the ducks this Spring and having picnics at the park. What are you looking forward to this Spring? We are absolutely looking forward to sunnier, muddier days. If you don’t have the opportunity to go to the store, you can also shop these darling shoes washable shoes for your toddler online.